I created this podcast because I believe that much can be learned from digging deep with interesting and successful people. You can learn more about me at www.blevenson.com. Eric Carcich joins us on this week’s episode of the podcast. Eric was previously the Head Women’s Rowing Coach at George Washington University and is now the Head Women’s Rowing Coach at Cornell University. Eric has always been passionate about the mental side of rowing. Eric will talk about his journey, how he first found rowing at UMass, and how he’s worked with elite rowers in men’s and women’s rowing. He is very intentional when he thinks about the culture and vision for the program that he’s running, and he cares deeply about his relationships in general, and about his relationships with the athletes that he serves. Thank you to Eric for coming on the podcast. You can reach out to Eric via email at ec862@cornell.edu and you can find Cornell Women’s Rowing at https://cornellbigred.com/index.aspx?path=wrow. 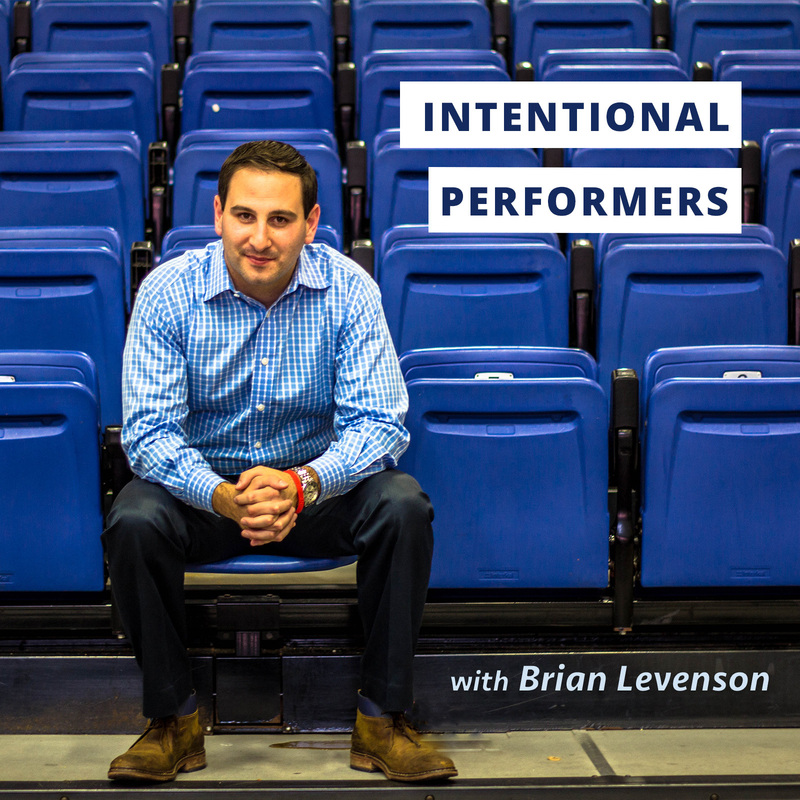 Lastly, if you liked this episode and/or any others, please support us at Patreon or follow me on Twitter: @brianlevenson or Instagram: @Intentional_Performers. Cody Royle joins us on this week’s episode of the podcast. Cody is passionate about coaching coaches. Cody is an author, keynote speaker, podcast host, and an Australian Rules Football Coach. He is the head coach for AFL Team Canada which is the men’s national program for Aussie Rules Football. Cody is a big voice in the crossover between leadership principles in sports and business. His first book, “Where Others Won’t,” proposed that businesses should look at how pro sports teams look at team dynamic and talent optimization in order to innovate. In this conversation, we also talk about how the sport’s world now needs to leverage some of business’ best practices when it comes to human development and what that might look like going forward. His podcast, “Where Other’s Won’t,” is a great listen and we highly recommend following Cody on twitter @codyroyle. In this episode, they discuss what life was like as a little kid (5:05), Aussie Rules Football and Cricket (7:30), what he likes about Aussie rules football (9:40), what his childhood was like (11:30), the values his mom passed down to him (12:35), what he thought his future would look like (14:20), how he felt when he couldn’t play at the level he wanted to (16:20), what an emotional wreck meant for him (17:20), why he got involved in coaching (18:10), the steps he took to become a coach (19:40), how he makes sense of the binary of I can do this better, but I still have a lot to learn (21:05), what he likes about coaching (22:30), his thoughts on the CEO mindset vs. a sports coach (25:05), the importance of flipping mindsets (28:40), what he likes about watching coaches (33:00), how he thinks about coaching coaches (39:10), the biggest challenge to people who want to coach coaches (42:40), the difference in being a team coach vs. a coach of coaches (48:10), how he ended up in Canada and why explore this space outside of just being a coach (53:10), what would happen if we used high-performance techniques from athletes to our coaches/front office (1:00:10), information about his podcast and book (1:03:00), why he thinks people were interested in being on his podcast (1:07:00), how he answers what he does (1:09:40), what makes a great writer and where he learned to write (1:10:40), where the idea of nuance and context came from for him (1:14:05), and what he’ll be doing 10 years from now (1:16:00). Thank you to Cody for coming on the podcast. His book and podcast are both called, “Where Others Won’t,” and you can find those on Amazon, iTunes, etc. You can find Cody on social media on Instagram and Twitter @codyroyle and https://www.codyroyle.com/ houses everything he does. Lee Sommers joins us on this week’s episode of the podcast. Lee is a strength and conditioning coach that does amazing work and truly cares about his clients. He is somebody who is a servant leader, somebody who wants to make his athletes and clients as strong as they possibly can be, and he has worked with the tip of the arrow athletes, most notably Katie Ledecky. Lee started working with Katie when she was 15 years old. Lee has carved out a niche for himself in the Washington, DC area working with elite swimmers. He will share his journey and how he became a strength coach at a really young age and helped build Sport and Health’s Sport and Performance Program that works with elite athletes. Thank you to Lee for coming on the podcast. He has started his own business called Purpose Personal Fitness https://ppf-fitness.com/ and he is also a part of Healthy Baller https://www.healthyballer.com/aboutus. He works with all types of athletes and all types of cliental. He is also currently working with swimming teams including both nation capital swim clubs out of Georgetown Prep and RMSC swim club out of the Rockville area. You can find him on social media at @leesommerspt on Instagram, and you can find him on Facebook at Lee Sommers. Dr. Norman Rosenthal joins us on this week’s episode of the podcast. Dr. Norman Rosenthal is a world-renowned psychiatrist, researcher, and author who first described seasonal affective disorder, also known as SAD. He pioneered the use of light therapy as a treatment during his 20 years at the National Institute of Mental Health. He is a highly cited researcher and best-selling author, and he has written over 200 scholarly articles and authored or co-authored 8 popular books. Dr. Rosenthal has worked in the weeds with patients and had a private practice while also going deep into the research. He has written books including “The Winter Blues,” and he also has New York Times bestsellers list called “Transcendence” and “The Gift of Adversity.” He has practiced psychiatry for over three decades, coached, and conducted numerous clinical trials of medications and alternative treatments such as transcendental meditation for psychiatric disorders. He and his work have been featured on Good Morning America, The Today Show, NPR, and other national media outlets. In this episode, they discuss what life was like for him as a kid (4:20), what guilt felt like for him (6:05), what it was like to be stabbed (6:40), how he thinks about gratitude (8:30), his experience with Viktor Frankl (13:50), the distinction between gratitude and forgiveness (16:40), his thoughts on grievances (19:10), if he’d do our jails/criminal system any differently (21:30), when he became a researcher and scientist (23:00), how his parents reacted to his career choice (24:30), the values his parents passed down to him (25:20), how he handles privilege while understanding how quickly things can change (28:30), how life is so multi-faceted (33:00), how he first thought of SAD (35:30), how the community first responded to SAD (38:15), why he didn’t stay on the path of research (40:00), what light therapy is (41:20), about transcendental meditation (43:30), how he thinks about spirituality (45:00), his thoughts on death (47:40), his writing process (51:30), his thoughts on the mindset in preparation vs. performance (55:30), what he does to make sure he’s mentally where he needs to be (59:20), what about his framework allows him to be open to other possibilities (1:01:30), how he navigates when to be open and when to be contrarian (1:05:30), the letter his mom wrote he and his siblings (1:09:50). Thank you to Dr. Norman Rosenthal for coming on the podcast. You can find more information about Norman at his website at https://www.normanrosenthal.com/ which lists his books and blogs he’s written. You can also find him on Facebook at https://www.facebook.com/groups/PoetryRx/. Miranda Holder joins us on this week’s episode of the podcast. Miranda is an Executive Coach that has a background in sport. She was a three-sport athlete in High School and then she found Rowing in College where she competed at an elite, high level. She then became a Rowing Coach and ended up becoming the Head Rowing Coach at Georgetown University. That journey of becoming a Rowing Coach ended up leading her to become an Executive Coach. Today, she spends a lot of time working with people in all walks of life in the corporate space, and she considers herself to be an insight wizard and she will give insight into how she came to develop her eye for coaching. She helps people see themselves in their situation more clearly, and for the people brave enough to do the work, there’s an incredible leader, person, and idea ready to surface. She loves to work with people on being the best leader or CEO that they can be while also taking risk to start a company or refusing to settle into a career path that doesn’t elicit joy and excitement. She loves helping people unlock their potential and at her core, she loves coaching. Thank you to Miranda for coming on the podcast. You can email her at Miranda@Mirandaholder.com, and we encourage you to check out her website https://www.mirandaholder.com/. David Vobora joins us on this week’s episode of the podcast. Since 2014, David has painstakingly built a business and a dream around training elite and adaptive athletes. Many of the athletes are wounded warriors, and his adaptive training environment gym provides free 9-week bootcamps to people with amputations, spinal cord injuries, and other disabilities. He’ll say in this conversation a lot of those people are veterans, but not all of them are. He has a ton of respect for veterans, and his foundation is about serving those who are adaptive athletes. David has appeared on the Ellen DeGeneres show, he’s been to the White House where he shook hands with President Obama, he has had President Bush accompany him, House Speaker Paul Ryan visited the foundation, and they presented him with a set of cuff links with the Presidential seal. Also, when David was 10 years old, a teenage neighbor sexually abused him, and we jump into this in the conversation. He will talk about how that shaped his life and his career. He played professional football for 4.5 years, and he had concussions, a major shoulder injury that ended his career, and he has been through a lot including getting addicted to opioids and his experience with suicide. David will share his journey, his mindset, and what he’s learned about emotion and building emotional strength in this deep conversation. Thank you to David for coming on the podcast. We encourage you to follow the Adaptive Training Foundation on Instagram, Facebook, and Twitter. Go to http://adaptivetrainingfoundation.org/ to check out their site that shows the rosters of the people that are training, and we encourage you to help this incredible mission. Don Yaeger joins us on this week’s episode of the podcast. Don is an award-winning keynote speaker, business leadership coach, 11-time New York Times best selling author and a long-time associate editor for Sports Illustrated. Don is a writer, but what has made him a great writer over the years is his thirst for curiosity on how people compete at their highest level. As a speaker, he has worked with audiences as diverse as Fortune 500 companies and Cancer Survivor groups, where he shares his personal stories. In this episode, you will hear how Don is a story-teller and many of the stories he tells involve elite competitors. He loves to share the human side of those elite performers in these stories. In this episode, they discuss when writing first came into his life (4:00), what life was like for him as a kid (6:40), how faith was a big part of his upbringing (8:50), the values his parents passed down to him (9:40), when sports came into his life (11:20), what he loves about sports (12:10), what inspired him to pursue a career in sports journalism (13:35), the similarities he observes in different environments that he’s involved in (16:20), if curiosity and/or competition can be developed (18:40), David Ross story about how he developed his leadership (21:05), what allowed David Ross to interpret something as feedback as opposed to criticism (25:20), what David Ross learned that makes a great teammate (27:20), how he saw people mentally prepare and then shift when they got between the lines (31:30), why he pivoted to do other things in his career besides journalism (35:40), when he feels most alive (39:50), his biggest fear (42:10), what he intentionally does to make sure his greatest fear doesn’t happen (42:40), if you can be great in your career while being great in your home life (43:50), what he does to be present (45:30), how he writes a book a year (46:40), and what he learned from himself from this conversation that he’ll take with him (51:30). Thank you to Don for coming on the podcast. You can follow him on Instagram, LinkedIn, and Twitter @DonYaeger and he shares a quote a day with a group of about 50,000 people at 8 am ET. He has also built an online learning class that has a meaningful purpose and takes them from point a to point b. Their first course just went live a few weeks ago, and it’s called Journey to Greatness, and they go through the elements of what he’s learned from the greatest winners he’s had a chance to work with. Bram Weinstein joins us on this week’s episode of the podcast. Bram covered the Washington Redskins for a number of years, worked on sports talk radio, and eventually became an anchor on ESPN’s SportsCenter. When he finished up at ESPN, he came back to the DC area in sports talk radio, and now he has decided that he wants to go into the world of podcast production. He brings a great perspective on performing under the pressure. He also shares his thoughts on media, and specifically sports talk media in this conversation. Thank you to Bram for coming on the podcast. You can find him @RealBramW on Twitter and Instagram. AmpireMedia.com will be coming out shortly, and it will coincide with the studio getting up and running. Bram is open for business and has a long history of performing so he brings a unique view point of how things should be put together. At the same time, he is looking forward to collaborating with people on ideas and stories and is open to all ideas. Honest Tea Founder Seth Goldman joins us on this week’s episode of the podcast. Seth Goldman is the Co-Founder and TeaEO Emeritus at Honest Tea. He started Honest Tea years ago and he is also the Executive Chair of Beyond Meat. We will talk about both companies in detail and the mission behind both companies. Honest Tea specializes in beverage that are a tad sweet, organic and fair trade certified. In March 2011, Honest Tea was acquired by the Coca Cola Company becoming the first organic and fair-trade brand in the world’s largest beverage distribution system. Honest Tea and Honest Kids is sold in over 140,000 stores in the US and Europe including McDonald's, Subway, and Chick-fil-A. Beyond Meat is also rapidly expanding distribution as the company seeks to expand the accessibility and availability of plant-based protein. You will hear Seth’s passion for vegetarianism and providing plant-based options that can provide protein for us. Seth is passionate about providing quality ingredients to humans so they can fuel their body and live a better life. Seth also serves on the board of Ripple Foods, the Yale School of Management, and Bethesda Green. Seth is a “multi-tasker” that likes to create, innovate, and disrupt, and he is passionate about making this world a better place. Thank you to Seth for coming on the podcast! We encourage you to check out Honest Tea and Honest Kids which is currently expanding around the country. Beyond Meat is also growing quickly and they have a beyond burger and beyond sausage that is available in places like Whole Foods, Kreuger, and Safeway, and also now at Carl’s Jr., BurgerFi, TGI Friday’s, and here locally at Silver. Seth is also on the board of Ripple Foods which sells plant-based dairy made with peas. Bethesda Green is the local non-profit he founded 10 years ago, and they have a green business incubator, and they are working hard to engage the community of Bethesda in sustainability and finding ways for them to live greener, more sustainable lives. https://www.netimpact.org/ is another organization he’s interested in that is helping to organize MBA and college students interested in business to pursue careers in socially responsible businesses. Last, his co-founder Barry Nalebuff and he published a comic book called Mission in a Bottle, and it’s a fun retelling of the Honest Tea story in a comic book story that shows the lessons they’ve learned. Brendan Tuohey joins us on this week’s episode of the podcast. Brendan is an Executive Director at PeacePlayers. Brendan grew up in the DC area in a diverse environment which has helped shape his life. At PeacePlayers they are inspiring people to see each other as people through the game of basketball. Brendan played Division 1 basketball at Colgate so he’ll talk about that experience, and then he’ll talk about his experience at Peace Players. Brendan serves over 100 employees and over 6500 kids throughout the world. PeacePlayers has sites in Israel, Cyprus, South Africa, Ireland, Los Angeles, Chicago, Detroit, Brooklyn, and Baltimore. They are expanding rapidly into the U.S. and their mission is to have people leverage the game of basketball so they can go into areas of conflict and start seeing each other as humans and develop empathy. Brendan is a terrific leader that empowers people in his organization and is very thoughtful about how he sets up his organization and what he wants the organization to be moving forward. Thank you to Brendan for coming on the podcast. PeacePlayers is currently making plans this summer for Baltimore, Brooklyn, Detroit, Chicago, and LA. If people are interested in getting involved, they can look at their website https://www.peaceplayers.org/. They also have a program on their website that supports volunteers, so we encourage you to check out the website.